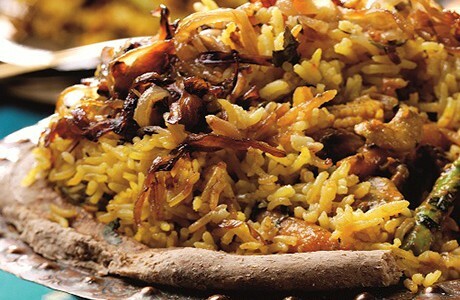 A delicious Biryani that gets its name from the royal chefs of Hyderabad, it is made distinctive by the flavours of sultanas, mixed nuts and desiccated coconut. Wash the rice in several changes of water and leave to soak for 30 minutes. Heat the oil in a pan and sauté the onions until golden brown. Add the washed drained rice, stir and fold gently until all the rice grains are coated in oil. Add half of the nuts, all the sultanas and coconut and continue tossing gently for 2 - 3 minutes. Add the Patak's Biryani Paste and water, stir and bring to the boil, lower the heat and cover. Continue to cook for 15 - 20 minutes until the water has evaporated. Turn off the heat and stand for 5 minutes. Gently fluff up the rice with a fork and garnish with the remaining chopped nuts before serving alongside your favourite curry.